Rovers led 26-8 in the fifth round Challenge Cup clash at Odsal with just under 10 minutes to go. Rovers players stop a charge from Bradford's Steve Crossley. PIC: James Heaton. The visitors looked home and dry but the Bulls had other ideas as they posted three converted tries to send the game to golden point. Jordan Lilley kicked the decisive drop goal on 85 minutes to hand Bradford an unlikely victory. Things could have been much different, however, as Jack Bussey - who was one of Rovers' star performers - came inches from scoring a potential match-winning try five minutes from time. The front rower, who was deployed at stand-off, then saw two drop-goal attempts in golden point fail to find the target. Makahesi Makatoa gets away from the clutches of a Bulls defender. PIC: James Heaton. "It is devastating," said a frustrated Ryan Carr. "We had done enough to win the game, all we had to do was show some composure and close it out. "We didn't, that is on us." He added: "We dropped the ball over the line with seven or eight minutes to go and didn't touch the ball until the end of the game. "You can't win if you don't have the ball. "They found some momentum and we weren't good enough to stop it, and we need to be good enough to stop it. "That is rugby league, teams have momentum and you have got to find a way to turn up. "I am disappointed for my boys, it is not up to the standard that we expect of ourselves. "We should have been better in the last 15 minutes." Featherstone were forced into fielding a makeshift side, with Bussey one of several players playing out of position. Forward Josh Walters was moved to right centre while centre Josh Hardcastle was shifted to the wing. Carr said: "We have got players playing out of position everywhere, it is what it is, we aren't going to make excuses for it. "We have got players doing things that aren't always their job. "It is a tough position to be put in." Bussey was playing in only his third game in 2019 and Carr added: "It was good to have Jack back, it was only his third game this year. "Last game he was front row and in this game he was a half-back, they are very different positions." Up next for Featherstone is the visit of York City Knights in the Betfred Championship on Friday evening. 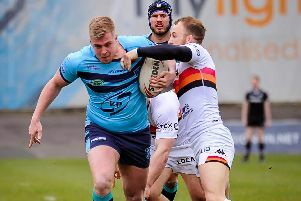 Carr's side will then only have two days' rest before welcoming Toronto Wolfpack to the LD Nutrition Stadium on Easter Monday.